Brake fluid will gradually absorb water from the surrounding air. The brake system will be damaged if there is too much water in the brake fluid. The boiling point of the brake fluid is also considerably reduced by the water content. Heavy use of the brakes may cause a vapour lock in the brake system if the water content is too high. Vapour locks reduce levels of braking power, considerably increase braking distance and can even cause the brake system to fail completely. Your own safety and that of other road users depends on having a brake system that functions properly at all times . Volkswagen has developed a brake fluid that has been optimised for the brake system in the vehicle. To ensure optimal operation of the brake system, Volkswagen recommends the use of brake fluid compliant with VW standard 501 14. Before using a particular brake fluid, check that the specifications printed on the container correspond to the vehicle requirements. Brake fluid that is compliant with VW standard 501 14 is available from Volkswagen dealerships. If this brake fluid is not available and it is necessary to use another high-quality brake fluid instead, brake fluid that is compliant with DIN ISO 4925 CLASS 4 or US standard FMVSS 116 DOT 4 can be used. Not all brake fluids that are compliant with DIN ISO 4925 CLASS 4 or US standard FMVSS 116 DOT 4 have the same chemical composition. Some of these brake fluids may contain chemicals that can damage or destroy brake system components over time. Volkswagen therefore recommends the use of brake fluid that is compliant with VW standard 501 14 to ensure sustained optimal operation of the brake system. Brake fluid that is compliant with VW standard 501 14 fulfils the requirements of DIN ISO 4925 CLASS 4 or US standard FMVSS 116 DOT 4. The brake fluid level must always be between the MIN and MAX marking on the brake fluid container or above the MIN marking . 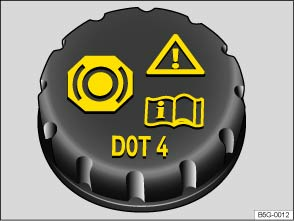 The brake fluid level cannot be checked accurately in all models as engine components may partially conceal the brake fluid container. If the brake fluid level cannot be read exactly, please proceed to a qualified workshop. The brake fluid level drops slightly when the vehicle is being used as the brake pads wear and the brakes are automatically adjusted. The brake fluid should be changed by a qualified workshop. Volkswagen recommends using a Volkswagen dealership for this purpose. Only brake fluid that conforms with the required specification should be used. Brake failure or reduced braking effect can be caused by the brake fluid level being too low or by brake fluid that is too old or unsuitable. The brake system and brake fluid level must be checked regularly. The brake fluid should be changed regularly. Heavy use of the brakes may cause a vapour lock if the brake fluid is left in the system for too long. Vapour locks reduce levels of braking power, considerably increase braking distance and can cause the brake system to fail completely. Please ensure that the correct brake fluid is used. Only use brake fluid that is explicitly compliant with VW standard 501 14. Any other brake fluid or a low-quality one can affect the functioning of the brakes and reduce their effectiveness. If a brake fluid compliant with VW standard 501 14 is not available, use a high-quality brake fluid compliant with DIN ISO 4925 CLASS 4 or the US standard FMVSS 116 DOT 4, but only in exceptional circumstances. The refilled brake fluid must be new. In order to reduce the risk of poisoning, never use bottles or other containers to store brake fluid. There is always a risk of someone drinking from such containers, even if they are labelled appropriately. Brake fluid must always be stored in its original sealed container and kept out of the reach of children. Brake fluid that has leaked or been spilt can damage the vehicle paintwork, plastic parts and tyres. Brake fluid that has leaked or been spilt should be cleaned off the vehicle paintwork and other components immediately. Brake fluid can pollute the environment. Any spilt service fluids must be cleaned up and disposed of properly.